In honour of the UK Bank Holiday, I am sharing with you the greatest thing I have ever made (and that statement may or may not also include my children! ðŸ˜œ). I would love to claim these truly delicious treats as 100% my own creation, but they were inspired by Jessica Mills. 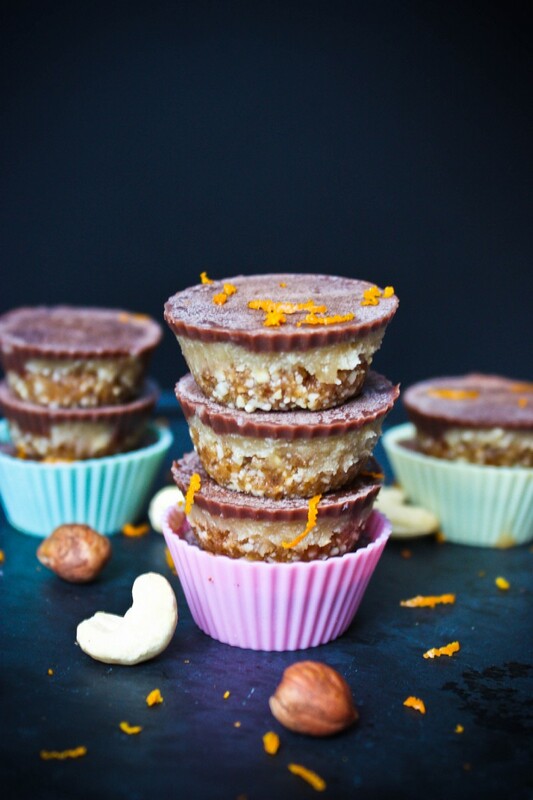 I first tried these beauties on finishing my Nutrition in Practice Course at Leiths, and as soon as I put one in my mouth, I knew I was in troubleâ€¦.in that moment, I knew I was going to be hooked forever. And now if there isnâ€™t a stash of these in my freezer, I become very anxious and itâ€™s all I can concentrate on until Iâ€™m fully loaded again! An indulgence for sure, but at least the whole family can enjoy these as they are refined sugar-free, dairy-free, wheat-free and gluten-free. So go on, treat yourself! I used individual silicone mini cupcake moulds for mine, but it is quite time consuming to have to do three layers in each one, so I would suggest you use a 20cm square tin and then cut into cubes. Much quicker and less hassle, but just not quite so pretty! Â· Add all of the ingredients for the base into a high speed blender and blitz until the consistency is a fine crumb, yet sticks together when you press it between your fingers. Â· Put this mixture into the tin and press down firmly to an even thickness. Â· Put in the freezer while you make the filling. Â· Combine all of the ingredients for the filling and mix well. Â· Pour over the base and pop it back into the freezer for 20 minutes. Â· Combine all of the ingredients for the topping and mix well. Â· Pour over the filling and return to the freezer to set for a couple of hours. Â· Best enjoyed straight from the freezer. Taco Tuesdayâ€¦.done the superfood way!